Operating a folding machine takes extra care and caution. Working with folding machines can be tough work; even the most seasoned folding machine operators gets the occasional nick or cut. All it takes is a moment of carelessness, inattention, or moving too quickly, and you’ve got a painful cut from the rotary cutting tools in the folding machine. Luckily, these cuts are never too bad, since, according to the Bureau of Labor Statistics, the number of cuts that are bad enough to result in lost work are too small to be statistically significant. However, it’s still good practice to try to minimize the number of injuries by practicing safe methods of handling rotary cutting tools. 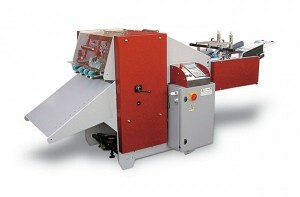 Here are some of our tips for handling the folding machine safely. Cut-resistant gloves are made of a mix of synthetic fibers such as polyethylene, spandex, Kevlar, fiberglass, and other materials. They were invented to protect chefs’ hands while working with knives in the kitchen while also being flexible enough for the chef to maintain a certain level of manual dexterity. Just as they can protect against knife cuts in the kitchen, these gloves can also protect against knife cuts in the bindery. You can wear them when handling and replacing rotary cutting tools to prevent accidental cuts. However, refrain from wearing the gloves around running equipment. Stark Safe and NoCry are both great brands of cut-resistant gloves that are available for purchase. Whenever you have a paper jam, it may be habit to simply reach in and start pulling out the paper. If you’re not paying attention when you try to fix a paper jam on a folding machine, you may end up with a serious cut. When rotary cutting tools are involved in a paper jam, first make sure to turn off the machine and hit the safety stop. Then, be sure to keep your eyes on the blades as you’re carefully removing the paper. You may even want to remove the slitter shafts first before removing the paper. Carefully replace the shafts after you’ve cleared the jam, turn the power back on, and you’re good to go! When your rotary cutting tools are not in the folding machine, they should be stored properly. You can store your tools in a blade holder with the cutting edges covered. If you don’t have a blade holder and are simply putting the blades in a drawer, be sure to wrap the blades first so that an unsuspecting hand reaching into the drawer doesn’t get a nasty cut. This entry was posted on Monday, May 30th, 2016	at 2:03 pm	and is filed under Equipment handling, industry practices	. You can follow any responses to this entry through the RSS 2.0	feed. Both comments and pings are currently closed.